Bloomington is 45 miles from the Indianapolis International Airport (IND). There are airport shuttles running every two hours and have drop locations at the Coutyard Marriot (GoExpress) and the Hilton Garden Inn (Star of America). Both of these drop sites are within 1 to 2 blocks of the Hyatt Place along College Ave. Shuttles typically run from 6:20AM until 10:40PM. Bloomington offers a wide variety of places to eat as the University has drawn in peoples from all around the world along with their excellent food. The ‘4th Street Restaurants’ is a common reference to trying out Thai (Siam House), Turkish (Anatolia), and Indian (Taste of India) cuisine. Sushi places are sprinkled throughout the east and west side of town with Japonee Express being one of the closer locations to the convention center. For our pizza lovers, those that have ever ventured to Bloomington before will tell you that there is no other place to go than Mother Bear’s Pizza. Breakfast will be taken care of at the conference, but if you still desire that selection of food you would not have to venture far to find Farm or the Runcible Spoon as a wise choice. Lunch will also be provided at the conference, but if you arrive early or decide to leave the day after the conference there is a good lunch/dinner place at Uptown Cafe where business attire is often seen.It is the go-to spot for company lunch meetings and celebrations. For those of you that plan to arrive the night before the conference, Megaputer hopes to see you at The Tap near 9:00PM (Tuesday, 20th). The Tap features Bloomington’s home craft and import beer, live music and sports. This will be a casual time to meet the Megaputer team and some of the guest speakers before the conference kicks off. The Tap accepts all major credit cards and cash. To our guest speakers, partners, and company guests, Megaputer would like to treat each of you to dinner at the Irish Lion Restaurant and Pub Wednesday, October 21st at 7:00PM. Be sure to set a reminder to meet us there. 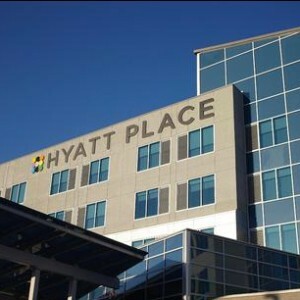 Its just a walk away from the Hyatt Place (see map below).